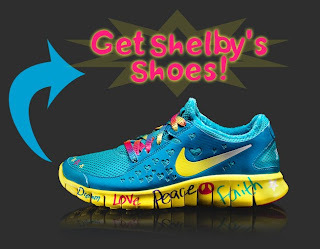 2007 - find your forever family - 2009 undergo 5 heart surgeries - 2010 become chosen as one of six to design one of the coolest pairs of Nike shoes ever made: this is Shelby Lee's life. ﻿﻿ As a young child in China, Shelby was diagnosed with single ventricle heart disease, a condition her orphanage did not have the resources to treat. Her Children's Hope adoptive parents, Mike and Tanya, brought her home and immediately took her to Doernbecher Children's Hospital, where she later had five surgeries to fix her heart. Shelby's presence in the Lee family is beyond value; her increased life expectancy, a great gift to her parents. To Doernbecher Children's Hospital, her bravery makes her a hero. 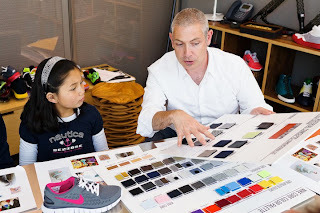 This year, Shelby and five other children were invited to participate in Doernbecher's annual fundraiser - Nike Freestyle - to redesign a popular Nike shoe. In October, Shelby and her family attended Portland's Freestyle Auction at Wieden + Kennedy Center where Shelby’s shoe, autographed by the Portland Trailblazers’ Brandon Roy, and artwork from her shoe were auctioned to a group of 300 special guests. Her large design team in Oregon was led by Peter Townsend, VP of NikeFootwear Design, and Suzi Sharp in manufacturing. Each designer was paired with a Nike team and was allowed to "go crazy" in the materials and design labs. After several drafts, Shelby received the final drawing and then in June she saw her shoe for the first time in a return visit to the Nike campus. At the auction, Shelby’s shoe fetched one of the highest amounts ~ $8,000 for her shoes and another $5,000 for the artwork created from her shoe. Shelby’s surgeon and cardiologist both came to the auction and bid, but they kept getting outbid! The October event raised more than $50,000 for Doernbecher Children’s Hospital. Nike also presented a check to Doernbecher for last year’s retail sales of Freestyle for just under $500,000. In the seven years this event has been running it has raised almost $3,000,000 for Doernbecher. "Probably the most amazing part of the whole experience is what it has done for Shelby’s esteem. She went from 8 years in a remote orphanage in a part of China with 80% unemployment, to designing shoes with one of the most successful companies in the world. She was treated like a celebrity throughout the entire process, including autographing a special book given to guests at the auction," shares Shelby's dad Mike Lee on his family blog. "We also want to thank God for this opportunity. Her shoe carries several elements from her life, all of which tell a story. From the broken heart in China on one shoe, to the mended heart in the US, to the sockliners in each shoe that are a map of her trip from China to her new home. The shoe is a testimony to the work God does in the lives of even 'the least of these'." Shelby has worn her shoes every day but when it was supposed to rain. You can remember her story and be reminded of this testimony, too. Buy Shelby's shoes and support a hospital that gave Shelby, and children like her, so much life. Buy Shelby's shoes! They are going fast. Not only do they make a great story of adoption, they also make a fantastic Christmas gift! This story is a summary from the Lee Family Blog and Nike. Read more about Shelby's amazing journey through her heart surgeries and see some of her 2010 adventures through her photo journal. Shelby has 2 sisters adopted from China, Anna and Lily, and 2 brothers, Jake and Nick.